Arrangements with North Oxford and District gives members access to some classic river fishing. With approximately 1 mile of the River Thames at Godstow; 1 mile of the River Cherwell near Marston and the Seacourt Stream. Closed 15 March to 15 June inclusive. 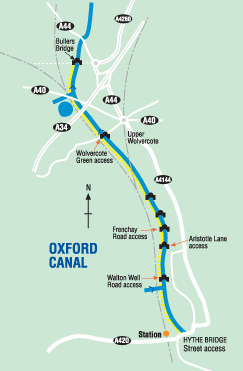 Four and a half miles of the Oxford Canal from Oxford to Kidlington are also available. Access from Wolverote to Wytham road bridge. Park in the Wolverote Bathing Place carpark. 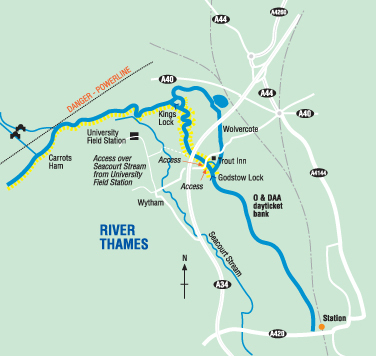 River downstream XXXX on the map can only be fished on an ODAA day ticket. ; Parking is not allowed in the Trout Inn. 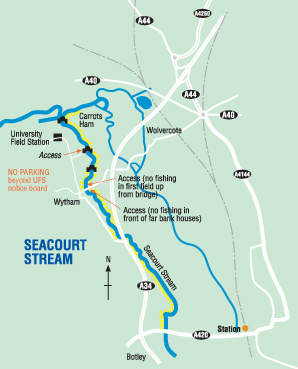 Access to Kings Lock end from University Field Station (See Seacourt Stream map) and top end of Pixey Meadow via bridges over the lock and Kings Weir. 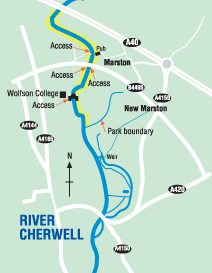 Access west bank from Marston Ferry link road B4495 from either cycle track or foot bridge as shown; downstream of bridge one meadow, upstream three meadows. East bank; upstream two meadows above Victoria Pub and downstream to park boundary fence opposite Wolfson College. Access from Wovercote to Wytham Village Road bridge. East bank No fishing opposite far bank houses on the south side of the bridge and no fishing in the firt meadow to the north of the bridge. Access also from the track leading to the University Field Station. Follow the road from Wolvercote into Wytham and turn right. Take the track to the UFS, park on the verge before the notice board. There is no parking and no turning beyond here. Walk across the the field to the stream. Crossing the bridge gives access to Kings Lock and Kings Weir Thames Area. Fishing towpath side from Hythe Bridge Street in Oxford, north to Bullers Bridge in Yarn Lane, Kidlington. Plough Inn at Wolvercote is a good access point for the first time visitor.